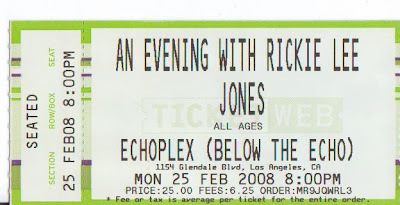 Lisa and I went to see Rickie Lee Jones last night at the EchoPlex. We have seen RLJ together many, many times. After each concert, we come out saying, "I think that was the best one ever." I think Lisa is right though. The best RJL concert was when she performed at The Wadsworth. Just Rickie, a guitar and a piano. But, last night was a really close second best. 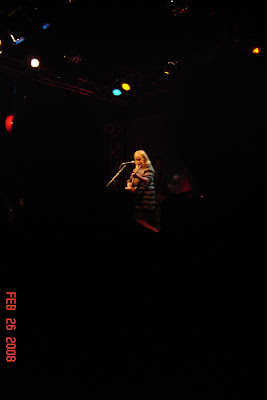 And, because she brought her dog, Juliet, onstage, I will forgive the couple of songs from "Ghostyhead". For those of you who are not familiar with Rickie Lee, I found this EchoPlex rehearsal video on YouTube. Just a taste of her genius.